In the future, Cheongpyeong will become the World Headquarters. In the future, Cheongpyeong will becomethe World Headquarters. It is the place, here in the land of Korea,where I offered the third and last devotion, so all of you need to know, without any doubt or mistake, that when I say this, it is a fact. First, I would like to offer limitless gratitude and glory to our precious Heavenly Parent and True Parents of Heaven, Earth and Humankind. time heaven has guided me, since the day I was called upon, were all preparation for this very day, and that this mission was a providential responsibility, given by heaven,one that I could not ignore. 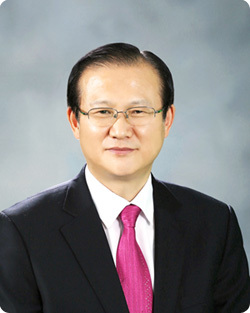 On October 27, during the International Leader’s Conference, True Mother said, concerning Dae Mo Nim, that“her achievements must be praised.”True Mother praised highly the achievements of Dae Mo Nim, and expressed her gratitude for the efforts of Hoon Mo Nim, who had offered her very body. I engraved in my heart her devoted lifestyle, and I will make efforts to live the kind of life that cannot be accused by anyone. True Father is in the spirit world, the subject world, and True Mother, who is one in heart, body, and mindset, and in harmony with True Father, is in the physical world, the object world. Atthe event commemorating the 40th day of Father’s seunghwa, True Mother said, “From now on my thoughts are Father’s thoughts, and Father’s thoughts are my thoughts.” We are in an age when True Father is working in the position wherein he is one in heart, body, and mindset, and in complete harmony with True Mother on earth. In this most historic time, the fact that I was appointed president doesn’t mean that I am the one who is most suitable for this position. First of all, as president, more than anything else I want to empty my heart. I will offer sincere devotion so that in that empty space of my heart, only True Parents, who are the King of Kings, can reside and work. I want to empty my heart in front of the words of the True Parents of Heaven, Earth and Humankind, who issue commands to the spirit world and the physical world, and I will attend them without any conflict in my heart. Second, I would like to see this training center overflowing with the holy spirit and with truth. True Parents long that all churches might overflow with the holy spirit and with truth. I want to see this training center become the central point that can light the fire of the holy spirit and the truth. Third, I want this training center to be transformed so that it resonates with this new era. When we welcomed the new millennium, True Parents said,“The new age of the twenty-first century is an age of universal values. It is an age when material things do not dominate our mind and spirit. It is an age in which we live in oneness with God. In the twenty-first century, people will realize that living for the sake of others is far more valuable than living for one-self. Self-centeredness will fade away and altruism, based on independence, mutual prosperity and universally shared values, will finally and triumphantly emerge.” (Korean) CheonSeongGyeong, page 1326. We will now become a training center which will meet that standard, and we will offer devotion so that we can become a training center that can enable all members’ hearts to want to live out and embody in their very bones the value of their lives so that they can become the owners of Cheon Il Gul in the twenty-first century.